A pedestrian plaza in North Hollywood was supposed to increase economic vitality in the area, but small business owners say they have seen no such improvements. 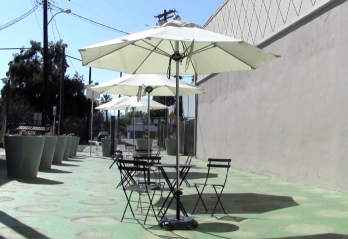 The bustling heart of the NoHo Arts District seemed like the perfect place to plant tables, chairs and umbrellas when the City of Los Angeles Department of Transportation (LADOT) began converting underused public spaces into pedestrian-friendly plazas through a program called People St. Modeled after Triangle Plaza in Silver Lake, the renovations in a previously barren alleyway were intended to strengthen community ties while drawing more traffic to surrounding small businesses. “I see the project as reclaiming a space for the pedestrian environment,” said Aaron Aulenta, a member of NoHo Community Partners, the group that proposed the site of the plaza. People St. accepts and reviews proposals for potential renovation spots from community groups like Aaron’s on a rolling basis. The NoHo Plaza was unveiled on March 1. Bookended by an abandoned dance studio and a family-owned Indian restaurant, the plaza is just north of a busy intersection on Lankershim Boulevard. And where? But unlike its thriving Silver Lake counterpart, not even a neon green, polka-dotted surface treatment could will community members into one of NoHo Plaza’s three sets of folding chairs. Even at first glance, the area is uninviting – on a lazy, 90-degree Saturday afternoon, the alley’s one-story walls and narrow surface area make for a sticky and sweltering sit-down experience. Not a single person makes use of any of the tables or chairs in NoHo Plaza during a Saturday afternoon. The People St. program is a facet of Mayor Eric Garcetti’s Great Streets initiative, which seeks to improve community gathering sites and spur economic growth. The program is based on a public-private partnership with business improvement districts (BIDs), in which the public agency manages administration while the BID provides funding to pave, paint and furnish these areas. LADOT spent approximately $50,000 on NoHo Plaza’s renovations, and the NoHo BID pitched in an extra $4,000 for furniture. With that information in mind, People St. conducts what Watson calls “pre and post-evaluation” surveys to asses each plaza’s impact on the surrounding neighborhood. Representatives from LADOT conduct pedestrian, vehicle and bicycle counts, and interview locals and business owners. “We evaluate our projects thoroughly,” Watson said. To quantify each plaza’s economic impact, People St. examines sales tax data from local establishments before and after the renovations. According to the data collected from Triangle Plaza, reported sales tax receipts during 2012-2014 increased from about $493,000 in 2012 to $675,000 in 2014. And that is not surprising—a Saturday afternoon in this plaza looks like an outdoor strip mall, complete with coffee drinkers, guitar players and small children running back and forth. So the results of Benjamin’s study proved accurate for Triangle Plaza, which has reaped financial benefits for businesses over the last two years. But his statistics hinge on one key component that is nowhere in sight at NoHo Plaza: an already available pool of people. And if the plaza is not attracting people in the first place, it is unlikely that it is prompting anyone to flock to local establishments. PJ Evans meandered through the plaza carrying a stack of worn out scripts and sipping a mason jar of Kombucha tea. He was headed toward The Raven Playhouse, an independent theater company where he performs and stage manages productions, just down the block from the plaza. Evans says he has never felt compelled to spend time in NoHo Plaza. Ogilvie has a mental laundry list of ideas to attract pedestrians to the plaza. He suggested that the space host community organized events like movie screenings or small music festivals featuring local bands so that people have a motive to visit the area. “And then, when they’re sick of listening to crappy music, they’ll come buy some of my hot dogs,” he smirked. People St. monitors each of its newly constructed plazas for one year. If the community feedback is poor, the program will revert the space to its original condition as an alley in 2016. But Auleta is hopeful that the lack of activity is just part of the plaza’s newbie slump. “[Pedestrian] traffic is slow right now,” he said. “But as more people learn about it, usage should start to pick up.” But People St. does have a one-year revocable permit on the plaza, just in case. Reach Staff Reporter Emily Mae Czachor here.